As someone who has been enjoying the geothermal evolution I could not be more excited to finally see variable speed technology begin to try and grow some roots in the marketplace. In 1984 I had the privilege, while working at Carrier, to actually have in my house in Central New York, what I believe was the first variable speed compressor operating in a geothermal system. Using a Carrier Triple Split Heat Pump, a Hitachi Inverter, and various R&D Products developed by Roger Voorhis et al, we achieved EER’s & COP’s that were “off the charts” at that time. However, I hope the manufacturer’s do not get all caught up in maximizing the value that is part of “the box” they are providing, simply to justify the extremely high price tag. As we work with various high end residential clients who not only expect “the best”, they demand it. Having a heat pump that comes from the factory with everything (just shy of including the kitchen sink) it makes it very difficult to incorporate into a overall system design that truly delivers the best system. It is THE SYSTEM that has to be the best, not just the heat pump, and every system has a unique set of requirements, from pool heating, snow melting, domestic water heating, incorporate solar thermal, not to mention heating and cooling. Consequently, I would like to challenge all the heat pump manufacturer’s to provide the best system component – a variable capacity, high temperature, simple water-to-water heat pump that would exude maximum flexibility without trying to dictate from the factory system design philosophies. One of the largest homes in Northern California is owned by Frederick Corson’s . He is proud with the very low heating and cooling bills. Carson fitted his residence with a ground-source heat pump known as a geothermal heat pump. The pump and pipe installation are environmentally friendly and sustainable, while they also keep the costs of heating and cooling the house minimal. This whole system works on the principal that regardless of the temperature on the Earth’s surface, it is always 60 degrees a few feet underground. 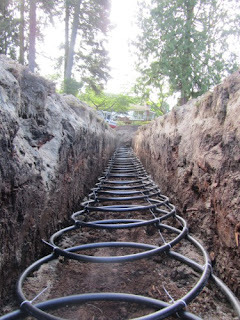 A geothermal heat pump is installed by first drilling holes 200 to 300 feet deep and then inserting U-shaped tubes into them. These earth-heat exchange tubes are then connected to a primary heat exchanger. The tubes are filled with a solution of water and alcohol, which prevent corrosion and freezing. The owner of the 5000 square foot home in California turn on this heating system in November and and keep it on through April. In the summer, the geothermal heat pump system can also be reversed to cool the house. To do this, the pump pulls the warm air out of the house and transfers t into the ground. TechNavio's analysts forecast the Heat Pump market in China to grow at a CAGR of 27.86 percent over the period 2013-2018. Automotive businesses urged to use Renewable Heat from Geothermal Heat pumps. Currently people can get a $300 tax credit for installing things like a geothermal heat pump in their homes. It expires at the end of the year. A Hybrid Heat system contains both an electric heat pump and a gas furnace. ... announces its 7 Series 700A11 geothermal heat pump has been honored with a prestigious 2014 AHR Expo Innovation Award in the "heating" category. If you want to keep your family warm this winter, it is important to have regular maintenance and geothermal heat pump repair by a trained technician. The 2014 AHR Expo feature nearly 2,000 leading manufacturers and suppliers from around the world showcasing hundreds of innovative new products to more than 55,000 industry professionals. The 2014 AHR Expo is co-sponsored by ASHRAE and AHRI. The Heating, Refrigeration and Air-Conditioning Institute of Canada (HRAI) is an honorary sponsor. ASHRAE's Winter Conference is held concurrently with the AHR Expo each year. Heating: Carrier, Carrier Infinity 18VS Variable Speed Heat Pump; LG Electronics U.S.A. Inc., Art Cool Premier High Efficiency Duct Free Heat Pump; Mitsubishi Electric Cooling & Heating Solutions, H2i R2-Series Variable Refrigerant Flow Heat Pump; Trane, TruComfort Variable Speed Split System Heat Pump; Weil-McLain, SlimFit Commercial High-Efficiency Condensing Boiler. The hybrid Swedish geothermal heat pump have a copper coil in the ground (1m below ground with a loop length of 15-30m ) combined with a quite fan-less air collector. The Swedish heat pump manufacturer Jifon AB offers this highly economical and reliable solution for heating with only one moving part, the compressor. Moreover, the installation of this hybrid air and geothermal heat pump is very simple. Either drilling or major excavation work is necessary and therefore is ideal for use even in smaller plots. The Swedish manufacturer offers this hybrid heat pump in three sizes, with 11kW, 15kW and 20kW power. “The Carrier team is excited by the opportunities this agreement will provide,” said Chris Nelson, president, residential and commercial systems, Carrier. This geothermal heat pump joint venture will bringing together the strengths of both companies, from Carrier’s rich legacy of innovation to Bosch’s well-equipped manufacturing plant in Fort Lauderdale. Establishing a relationship between Carrier and Bosch will allow us to leverage our research and development resources and continue to deliver high quality manufactured geothermal heat pumps to our customers., said Richard Soper, The Bosch Thermotechnology Corp president. Carrier and Bosch form a joint venture to develop and manufacture geothermal heat pumps for the North American residential and commercial segments. The moment is right With sales of geothermal heat pumps expected to nearly triple by 2020. The American Taxpayer Relief Act of 2012 passed in January 2013 retroactively extends tax credits for homeowners replacing heating and cooling equipment for their primary residence with qualifying, high-efficiency geothermal heat pumps. 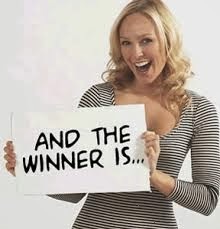 Tax credits are available for 2013 and retroactive to January 1, 2012. To qualify for a federal tax credit , there are efficiency requirements of 15 SEER / 12.5 EER / 8.5 HSPF for geothermal heat pumps. Geothermal heat pump purchase must be for your principal residence and be “placed in service” between January 1, 2012 and December 31, 2013. “Placed in service” means when the original installation of the geothermal heat pump is completed. Geothermal heat pumps placed in service starting in 2009 are eligible for a tax credit equal to 30 percent of their installed cost, with no maximum. Hoffmann Brothers is the St. Louis, Missouri Geothermal Heatingand Cooling Contractor. Another local geothermal contractors iare Sheet Metal Contractors. They serve St. Louis, Jefferson, Franklin, St. Francis and Ste Genevieve in addition to Madison, St. Clair, Monroe and Randolph county. It is very important to find good local geothermal contractors to Install a geothermal heat pump system. The quality of the installation definitely plays a large part in determining the efficiency of the geothermal heating and cooling system. The quality contractor should perform a proper Heatload Calculation until a contract is signed or an upfront fee is paid. Look for experienced geothermal contractor and an driller who is familiar with the local terrain. The Ontario Geothermal Association is a not-for-profit corporation helping to advance Ontario's geothermal industry. They link consumers with local geothermal contractors. I made a list of few geothermal contractors in Ontario with good reviews. Ground Heat Systems International Inc.
Borealis GeoPower obtained the geothermal exploration permits from the BC Ministry of Energy on October 17, 2010. The Canoe Reach Geothermal Project is a notional +/- 10 MWe standard hydrothermal project that is currently in the midst of exploration and assessment. It’s development would represent the ﬁrst commercial geothermal power production in the Province of British Columbia and the ﬁrst, fully green, baseload power generation alternative to large scale hydro in the Province. A geothermal demonstration project has been approved for funding in the amount of $10-20 million under the Natural Resources Clean Energy Fund in the small northern community of Ft. Liard, NWT. The project, which is a collaborative effort between the federal government, the Acho Dene Koe First Nation and Borealis GeoPower Inc., aims to deliver a minimum of +/-1 MWe of electrical power (Phase I) and also +/- 1 MWth of direct heat (Phase II) to the Ft. Liard community (~750 homes) and it’s local greenhouse complex. initial resource estimate has been completed with a positive outcome. The assessment suggests the economic viability of small geothermal power plants ( < 5 MW), but with additional rights secured on subsequent locations, DEEP can potentially achieve > 50 MW of clean power production. While the project is privately funded, DEEP was selected in SaskPower’s 2011 Green Options Partners Program Lottery for a Power Purchase Agreement (PPA), which will help in raising capital for initial geothermal drilling, expected to commence in 2013. Type of funding: Privately funded. Currently raising funding in private sector. Development Fund (NDF) have launched a new project to support geothermal exploration in East Africa Rift Valley States (EARS) covering 13 countries: Burundi, Comoros, Djibouti, DR Congo, Eritrea, Ethiopia, Kenya, Malawi, Mozambique, Rwanda, Tanzania, Uganda and Zambia. Geothermal project funding covers reconnaissance and geothermal exploration leading up to exploratory drilling, training, e.g. through the UNU Geothermal Training Programme, institutional capacity building and policy and legal framework for geothermal utilization. Slinky loops design. 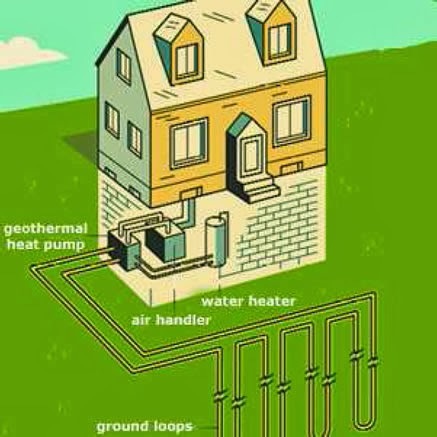 Horizontal geothermal heat pump istallations. Slinky loops are made of geothermal pipe that is coiled into many loops and buried in horizontally dug trenches in the earth. The plastic heat exchanger pipes are typically laid flat in a circular pattern at the bottom of a trench. The Slinky Loop design is a horizontal closed loop designed for areas of less land and shorter trenching. This loop requires more pipe, but less land (and excavating cost) than a single pipe trenched horizontal loop. It will often require a larger diameter pipe, and thus more antifreeze (making it more costly), than a single-pipe, trenched horizontal loop. Other design factors should be considered with a slinky loop system, so be sure to ask your contractor about the loop design parameters. These residential closed-loop ground source heat pump (a.k.a geothermal or groundcoupled heat pumps) design guidelines were developed in conjunction with a project sponsored by the Tennessee Valley Authority in conjunction with a TVA Ground Source Heat Pumps promotion. Previous guidelines were verified and adjusted according to data gathered during this effort and previous similar projects. A set of recommendations for loop sizing, piping guidelines, piping arrangements, and antifreeze precautions is provided. They attempt to balance the conflicting constraints of installation cost and efficiency. These guidelines have recently been extended to regions beyond the TVA service territory. normal applications. In homes with excessive run times this temperature will be 3 to 5 F higher. The table also includes recommendations for vertical ground loops in ft. of bore per ton for ¾” and 1-1/4” HDPE, which will operate about 5 F cooler than the horizontal loops. Multiply length of trench by pitch to find required length of pipe. Installing a geothermal heat pump (horizontal loop) What you need to know. Installing a slinky loop ground source heat pump. We run the 50 degree water through a heat pump. By compressing Freon, we draw heat from the 50 degree water, and return it to the underground pipe at say 40 degrees. For cooling, we reverse the hybrid heat pump, and return it to the underground pipe at 60 degrees. The heat pump operates more efficiently. 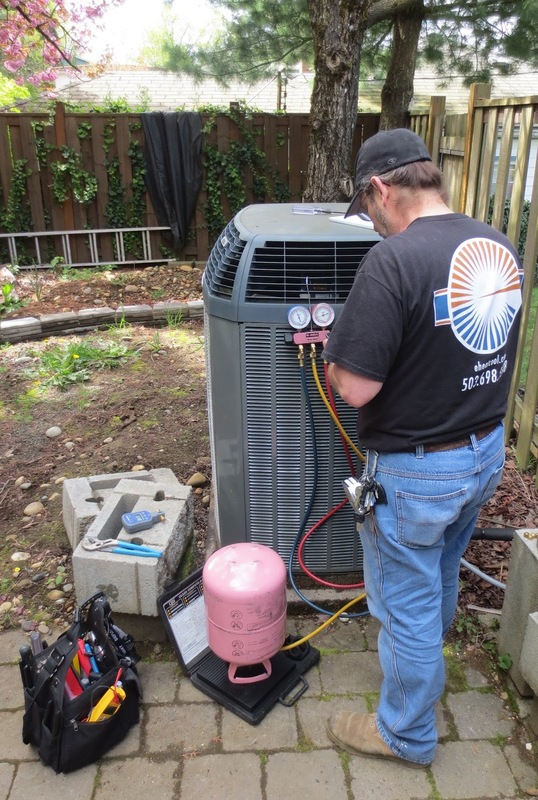 Maintanance services that improve heat pump efficiency include changing the filter, sealing ductwork leaks and verifying proper refrigerant charge. More efficient. Heat pump equipment, which lowers your bills and helps the environment. Fixing refrigerant leaks, lubricating the motor and cleaning away dirt all help to lower energy consumption. Improved comfot. Measures that improve your comfort include verifying correct electric control, calibrating the thermostat and ensuring that no return and supply registers are blocked.